David Downing grew up in suburban London. He is the author of numerous works of fiction and nonfiction for both adults and children, including four novels featuring Anglo-American journalist John Russell and the nonfiction work Sealing Their Fate: The Twenty-Two Days That Decided World War II. He lives with his wife in Guildford, England. "One of the most intelligent and persuasive realizations of Germany immediately before the war." "[A]n unconventional thriller ... a finely drawn portrait of the capital of a nation marching in step toward disaster as the Nazi rulers count cadence." "There's nothing better than a well-written WWII thriller. Alan Furst continues to prove it, and now Downing has shown he can produce that creepy sense of paranoia along with the best of them." "Smooth, scary wartime thriller drenched in period atmosphere." "Downing's fine new thriller introduces a clever and honorable hero ... [the ending] will have readers holding their breath ... Satisfying." "If you like your tales spiced with morally ambiguous characters right out of Graham Greene, this is a train you need to be aboard.... A marvelous return to cerebral espionage." 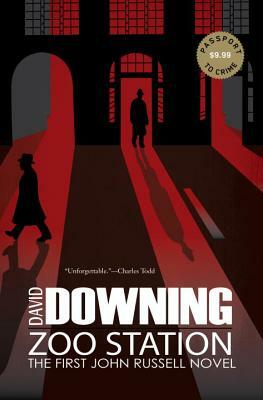 "A deeply satisfying, suspenseful novel... David Downing's writing is intelligent and strong; his portrayal of issues and conflicts, clear and compelling.... His imagery is so evocative that readers will feel they are watching a classic film, like Casablanca." "A beautifully crafted and compelling thriller with a heart-stopping ending as John Russell learns the personal faces of good and evil. An unforgettable read." "In the elite company of literary spy masters Alan Furst and Philip Kerr ... [Downing is] brilliant at evoking even the smallest details of wartime Berlin on its last legs."